Pull down the lock-release lever (1) on the steering wheel column and adjust the steering wheel angle (2) and position (3, if equipped). Move the steering wheel, so it points toward your chest, not toward your face. Make sure you can see the instrument panel warning lights and gauges. 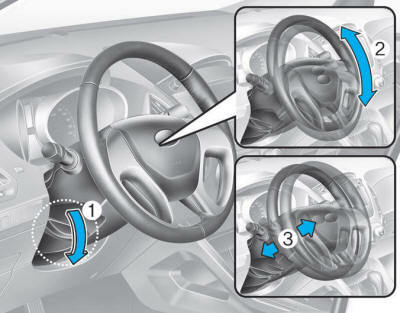 After adjusting, pull up the lock-release lever (1) to lock the steering wheel in place. Push the steering wheel both up and down to be certain it is locked in position. Always adjust the position of the steering wheel before driving. NEVER adjust the steering wheel while driving. This may cause loss of vehicle control resulting in an accident.